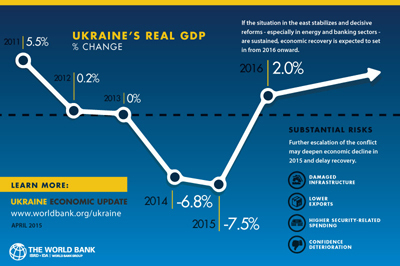 In the World Bank's most recent macroeconomic report on Ukraine, released on Wednesday, it said financial and structural reforms will be imperative as the nation tries to recover from its struggles with Russia. The World Bank predicts that the country's gross domestic product will decrease by 7.5 percent in 2015, compared with 2014's 6.8 percent decline. This is largely attributed to ongoing conflict with Russia, which has complicated stabilization efforts. Gradual recovery is possible in 2016 should the conflict subside and further reforms sought. The World Bank said imbalances are exacerbated by these GDP contractions, and that in order for these contractions to become less of a concern, it suggested deficit-reduction measures. It said this would also improve its sovereign standing for international lenders and capital markets. The World Bank pledged an additional $2 billion in loans to Ukraine in February.